With the controversy over family separations, much of the political rhetoric in recent weeks has focused on illegal immigration. We thought it would be helpful to take a step back and look at some measures of illegal immigration in a larger context. For example, how many immigrants live in the U.S. illegally, and how many are caught each year trying to cross the Southwest border? How many of them are families or unaccompanied children? And how have these statistics changed over time? Let’s take a look at the numbers. How many immigrants are living in the U.S. illegally? There were 12.1 million immigrants living in the country illegally as of January 2014, according to the most recent estimate from the Department of Homeland Security. The estimates from two independent groups are similar: The Pew Research Center estimates the number at 11.1 million in 2014, and the Center for Migration Studies says there were 11 million people in 2015 living in the U.S. illegally (see Table 1 in the full report). That would be about 3.5 percent to 3.8 percent of the total U.S. population in 2014. All three groups use Census Bureau data on the foreign-born or noncitizens and adjust to subtract the legal immigrant population. And all three groups say the population of immigrants living in the country illegally has been relatively stable since about 2008-2009. DHS estimated that the population had increased by 500,000 people total from 2010 to 2014, which “reflects relative stability,” especially when compared with 500,000-person increases each year on average from 2000 to 2007. The Pew Research Center found a peak of 12.2 million in the population in 2007, decreases for 2008 and 2009, and then a “relative stability” since then. All three groups find Mexicans make up the majority of the undocumented population — 55 percent in 2014, according to DHS — but the number and share of Mexicans among this population has been declining in recent years. 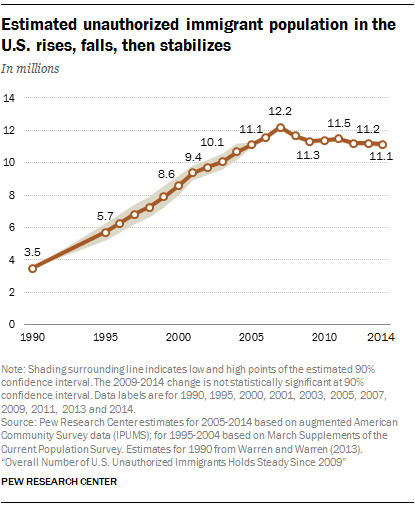 Those living in the country illegally also have increasingly been here for 10 years or more. DHS says more than 75 percent in 2014 have lived in the U.S. for more than a decade, and only 5 percent came to the country over the previous five years. How many people are crossing the border illegally? There’s no official measure of how many people succeed in illegally crossing the border, but authorities use the number of apprehensions to gauge changes in illegal immigration. 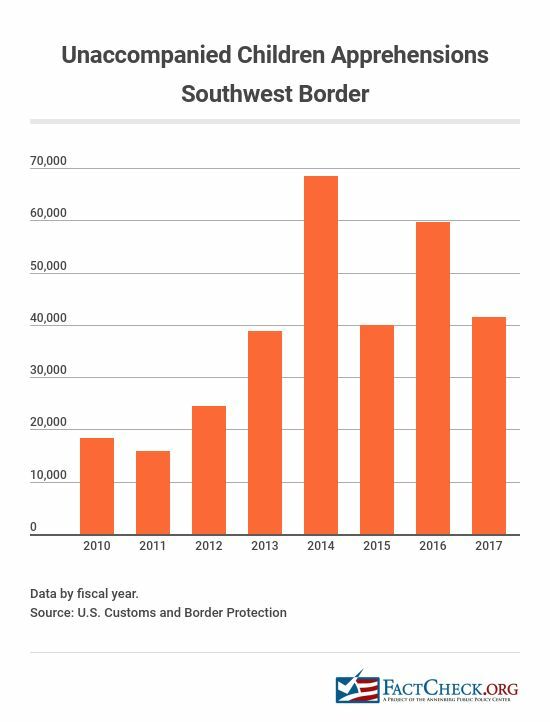 Apprehensions on the Southwest border peaked in 2000 at 1.64 million and have generally declined since, totaling 303,916 in 2017. Those numbers, which come from the U.S. Customs and Border Protection, are for fiscal years and date back to 1960. That’s an 81.5 percent decline in the number of apprehensions between the peak in 2000 and 2017. We can also look at how the figures have changed over the past several years. 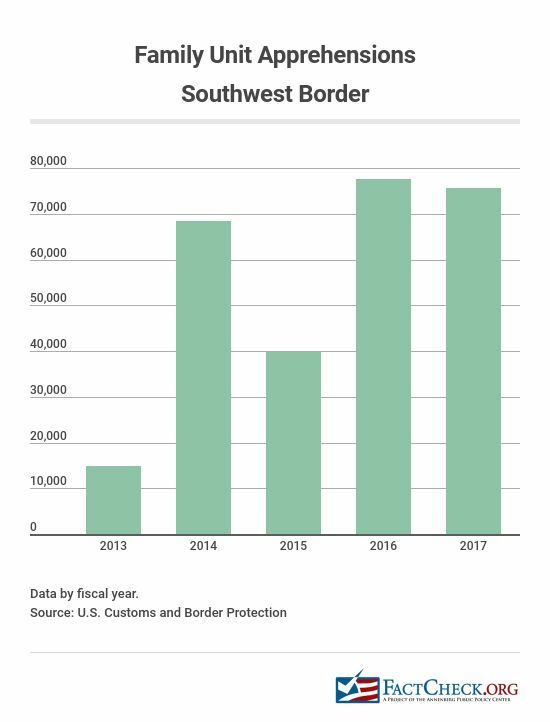 Under the Obama administration, the yearly apprehensions on the Southwest border declined by 35 percent from calendar year 2008, the year before President Obama took office, through the end of 2016. In President Donald Trump’s first full year in office, the apprehensions declined by 43 percent, from calendar year 2016 to 2017. On a monthly basis, the apprehensions decreased significantly during the first six months of Trump’s tenure and then began to rise back in line with the level of apprehensions from 2016. What about people overstaying their visas? 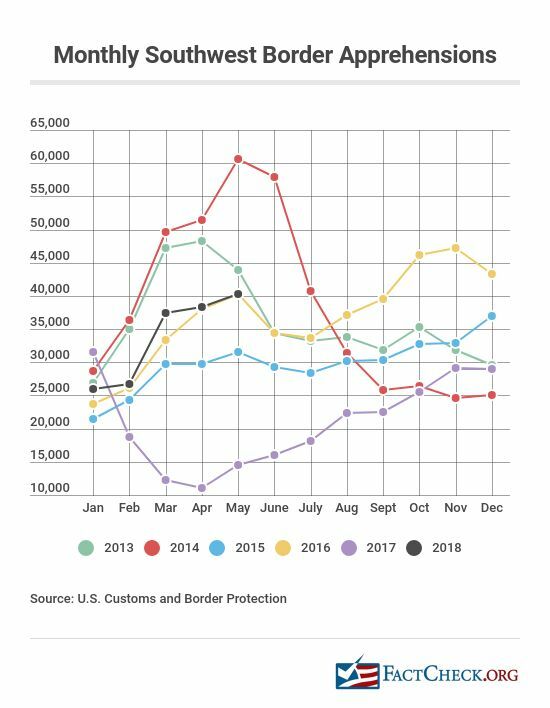 As border apprehensions have declined, estimates show a growing proportion of the undocumented population legally entered the country on visas but overstayed the time limits on those visas. A Center for Migration Studies report estimates that 44 percent of those in living in the U.S. illegally in 2015 were visa overstays. That’s up from an estimated 41 percent in 2008. There are no solid, long-term estimates of the visa overstay problem. When we wrote about this issue in August 2015, DHS told us it didn’t have statistics on visa overstays. But DHS has since issued some estimates. It said that about 629,000 people on visas who were expected to leave in fiscal year 2016 hadn’t done so by the end of that fiscal year (that’s out of 50.4 million arrivals). That number, however, had declined to about 545,000 by January 2017, DHS said, noting that it expected the estimate to “shift over time as additional information is reported.” CMS disputed the DHS estimate, finding that the number was too high. What about families trying to cross the border illegally? The number of family units apprehended has increased since fiscal year 2013, the first year for which we have such data. While 3.6 percent of those apprehended in 2013 were in a family unit, the proportion was 24.9 percent in 2017. In fiscal year 2013, according to Customs and Border Protection data, there were 14,855 people apprehended on the Southwest border who were part of a “family unit” — those are individuals, including children under 18, parents or legal guardians, apprehended with a family member. The number increased significantly in fiscal year 2014 to 68,445. Then, it dropped the following year to 39,838, before increasing again in fiscal year 2016 to 77,674. The figure was similar in 2017, and it’s on track to again top 70,000 this fiscal year. We asked Customs and Border Protection if it could provide family unit figures for years prior to 2013. We have not received a response. How many unaccompanied children are caught trying to cross the border? Using the same time period that we have for family units, the number of children under age 18 apprehended crossing the border without a parent or legal guardian was about the same in fiscal year 2013 as it was in 2017 — around 40,000. But it fluctuated in the years in between. In 2014, the Obama administration dealt with a surge of unaccompanied minors on the Southwest border, largely due to those fleeing violence and poverty in the “northern triangle” of Guatemala, Honduras and El Salvador and false rumors about “permits” being issued, as we explainedat the time. The number of apprehended unaccompanied children rose from 38,759 in fiscal year 2013 to 68,541 in fiscal year 2014. It went back down to just under 40,000 the following year. It’s on track to be similar in fiscal 2018. CBP data for unaccompanied children go back further than the available statistics on family units. In fiscal year 2010, the number of unaccompanied children apprehended was 18,411. 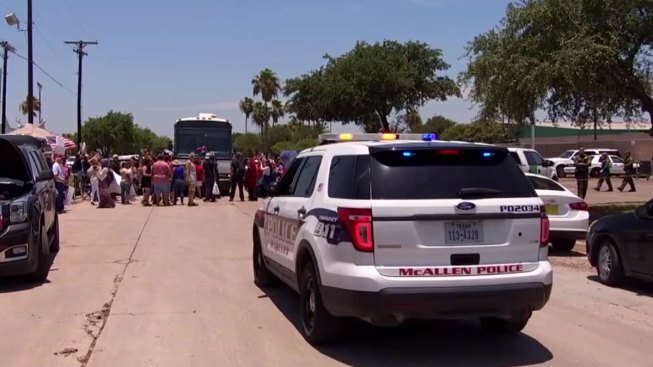 How many unaccompanied children, including children separated from their parents, are being held in shelters in the U.S.? Unaccompanied children are referred to the Department of Health and Human Services’ Office of Refugee Resettlement. HHS said during a conference call on June 26 that there were 11,800 children in ORR shelters, with 2,047 of those being children who had been separated from their parents. The rest — about 83 percent — had crossed the border without a parent or legal guardian. The ORR program houses the children in about 100 shelters in 14 states. In May, an HHS official told Congress that children had spent an average of 57 days in such shelters in fiscal 2018 before being placed with a sponsor, who could be a parent, another relative or a non-family member. About 80 percent or more of the unaccompanied children referred to HHS over the last several years have been age 13 and older, according to HHS statistics, and about 90 percent or more have been from Honduras, Guatemala and El Salvador. Yes. Customs and Border Patrol says 10 percent of those apprehended in fiscal year 2017 were caught more than once that year. In 2016, the figure was 12 percent. How many border patrol agents are there? In fiscal year 2017, there were 19,437 border patrol agents. The number peaked in fiscal year 2011 at 21,444, so it has declined a bit since then. But the number of agents is still much larger than it was about two decades ago. The vast majority of agents are assigned to the Southwest border. 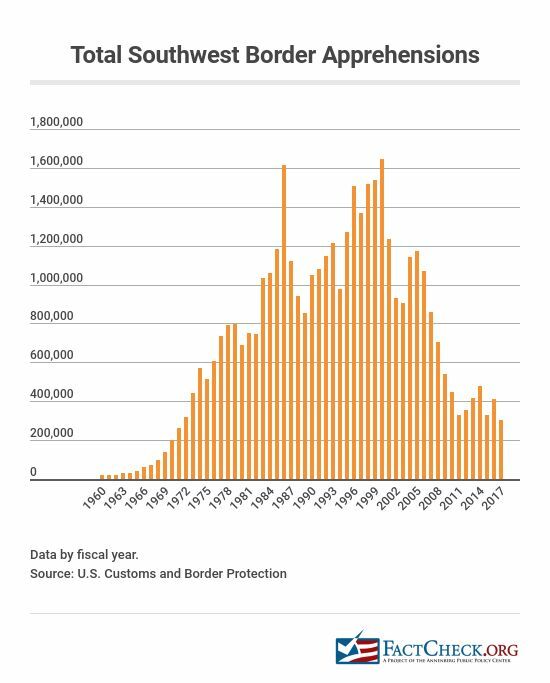 Back in fiscal year 2000, when apprehensions peaked at 1.64 million, there were 8,580 agents assigned to the border with Mexico. In 2017, when apprehensions were 303,916, there were 16,605 Southwest border agents. How many people are deported each year? There are also “returns,” which are “inadmissible or deportable” immigrants who leave voluntarily before a formal removal order is issued. Returns totaled 106,167 that year. 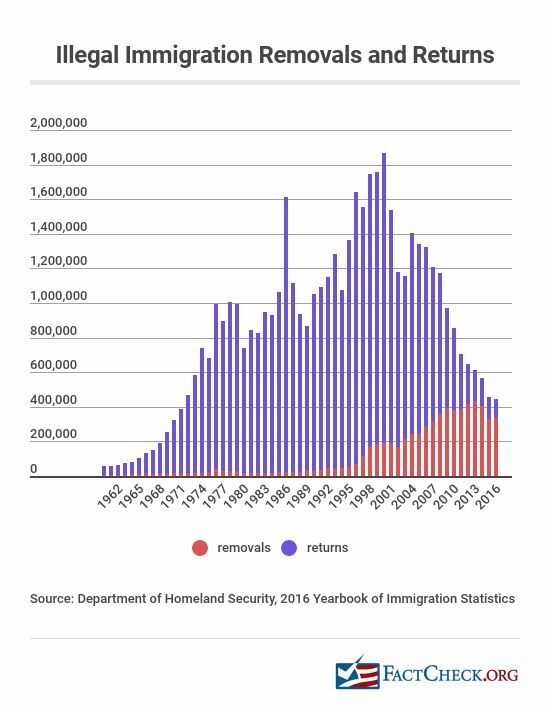 The peak for combined removals and returns was 1.86 million in fiscal 2000 — the same year that apprehensions on the Southwest border also peaked. In fact, the bar graph of these statistics mirrors the graph on apprehensions (see above) — generally, when apprehensions were higher, so, too, were removals and returns. Since fiscal 2011, removals have been higher each year than returns. Before that, the reverse was true.